A great Paleo alternative to spaghetti noodles. Works as a side or main dish! 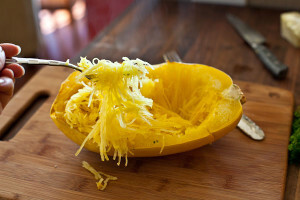 Step 2 Split your spaghetti squash in half and scrape out mushy insides. Step 3 Place the squash -- flesh side up -- on a sheet pan lined with aluminum foil or parchment paper, and drizzle with olive oil, salt and pepper. Step 4 Flip squash over so that the flesh side is down, and place in over for approximately 45-60 minutes, or until flesh falls apart easy. Step 5 While still warm, use a fork to scrape the flesh of the squash. It will look stringy like spaghetti noodles! These Noodles can be used in a variety of dishes, including: as a bed for our awesome Asian Stir Fry with Paleo Noodles, chopped and crisped up as hash browns for breakfast, in soups, or any Italian style pasta dish! One Response to "Roasted Spaghetti Squash"
Aha! A sub for hashbrowns for breakfast! YAY!